It’s one small little package that packs quite a flavourful punch! There is no AFC and basically no Juice Well, at first glance you would think this would leak like crazy but it doesn’t (mind you it’s not really a dripper, more of a painter, you paint your coils like we all did with the Wotofo Freakshow). The Freakshow is a great comparison for the Pugio’s design, they are both Bottom Airflow RDAs but the Pugio is just way better. More flavour, less hassle, easier to build, and a hell of a lot smaller. The Clamp Style build posts are a joy to work with, they trap you wire very easily and keep the conductivity high as hell. 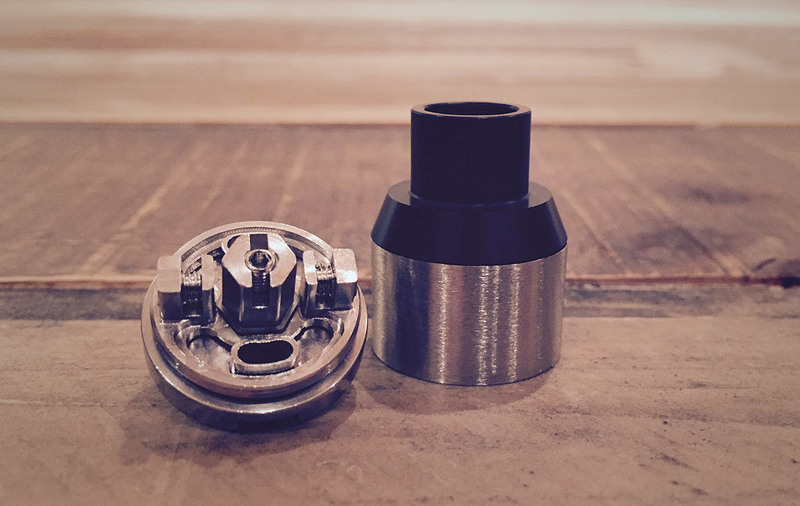 This has to be one of the best we have seen, it makes us wonder just how good the M-Atty RDA is (they both have this clamp style going on). These clamps also make working with Temp wire (Stainless, Ni200, or Titanium) a breeze. Building is up to you, decide on a center build or an offset, either way you can adjust the airflow to be directly under your coils. We went with a centred 6 wrap, Spaced 26ga, 2.5mm, dual coil build coming in at 0.35 Ohms and have been enjoying it at 58-60W. It’s a warm tasty vape and maybe it’s the design or the conductivity but you can taste you coils going dry very accurately. It seems to like the voltage, with the numbers we have been pulling its been in and around 4.5V without any carbon build up on the coils and it seems like it will vape like this for days. Wicking this one is a joke it’s so easy. Cut your wicks to be inline with the outer deck and prime them and then stuff them gently into place leaving room for the airflow that’s it (basically they just sit on the deck). Juicing this one is just as easy but a bit of a pain as you will be painting those coils like mad. Although then again you can get about 12 drops in there about 3-4 drops per wick end and this will give you about 6-8 tasty long pulls of vapor! It’s a Flavourchaser but you get some pretty fine clouds. 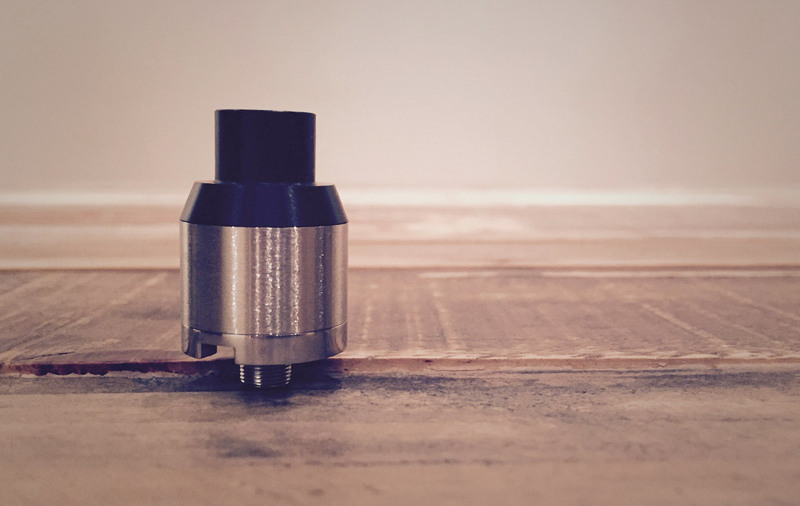 The Airflow is dialled in, it has just the right amount of restriction and the air is very well directed through your coils. There is a bit of a shotgun or vacuum effect when you take a pull that is rather satisfying. As much as we would like to fault that lack of an AFC we can’t, the Airflow is just right. Flavour is crisp and clean, really quite a surprise for how open the drip tip and airflow slots are. You can take really long hauls and the flavour just continues to build. 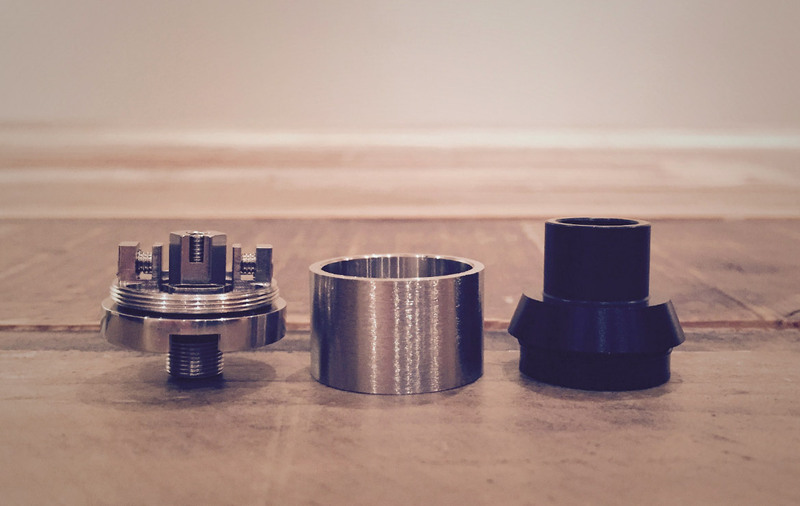 A quick note and thank you to Trevor Jones, adding an o-ring at the base of the atty to stop any condensation or leaking (if it happens) from getting into your 510 is a must.